My Video Data Saver goes missing every month. It usually appears again when a new billing cycle starts. To be clear what happens is first it disappears from the pull down menu for the usage meter. However at this point if I hit open on the pull down menu video data saver appears below settings on the sidebar. 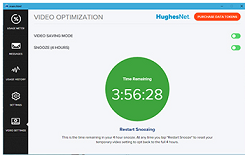 Then this disappears after a few days and I can only disable the VDS by going to my account on Hughesnet and using the setting menu. Then this will disappear, leaving me know way to disable this feature. The resulting video quality on Youtube is terrible. Sometimes if I restart my computer I bunch of times it magically reappears. That does not always work. I have tried deleting and reinstalling the Usage Meter, that has not worked. I currently have 21 days left in this billing cycle and the VDS is gone which is very frustrating. I have brought this problem to Hughesnet attention before. The last sentence says I can opt out of the VDS permanently. How do I do this? It would save me much frustration and anger. Thank you for your reply. I must apologize I did not fully understand how the VDS works. I thought I had to keep hitting the bottom button to put it into snooze. I did not realize I could permanently disable the VDS with the top button. My VDS did return and I have toggled it off permanently, so this should not be a problem in the future. Thank you Liz! There's another user here who's experiencing the same or similar -- HN is looking into this. They may ask you for screenshots, so you may want to get some. *I am not a Hughesnet employee or representative. This is a customer-to-customer tech support community, and I am a customer. Thanks for sharing your experience in detail, this is insightful for our engineers, to whom I've sent your concern. Please correct me if I'm wrong, but normally you wanted to toggle VDS at will? So if VDS happened to be on and you wanted to turn it off for a movie, you would check your VDS settings to turn it off? That toggle for VDS is permanent, so if you switch it on and leave it alone, it will always be on. If you turn it off, it will stay off. Are you saying that around these times the VDS setting disappears, VDS reverts to the opposite setting? The top switch lets you permanently keep VDS on or off. The bottom swtich will turn VDS off for only 4 hours, after which it will turn back on. Make sure the snooze option is also disabled. An update from engineering: An adjustment has been made and you should have the VDS setting available to you now. Whew! Thanks for the clarification, we were worried VDS was acting extra funky for you. Glad that's sorted out now. Have a great weekend!